Coccolithophores—tiny calcifying plants that are part of the foundation of the marine food web—have been increasing in relative abundance in the North Atlantic over the last 45 years, as carbon input into ocean waters has increased. Their relative abundance has increased 10 times, or by an order of magnitude, during this sampling period. This finding was diametrically opposed to what scientists had expected since coccolithophores make their plates out of calcium carbonate, which is becoming more difficult as the ocean becomes more acidic and pH is reduced. These findings were reported in the November 26th edition of Science and based on analysis of nearly a half century of data collected by the long-running Sir Alister Hardy Foundation (SAHFOS) Continuous Plankton Recorder sampling program. “The results show both the power of long-term time-series of ocean observations for deciphering how marine microbial communities are responding to climate change and offer evidence that the ocean garden is changing,” said Dr. William Balch, senior research scientist at Bigelow Laboratory for Ocean Sciences and a co-author of the paper. “We never expected to see the relative abundance of coccolithophores to increase 10 times in the North Atlantic over barely half a century. 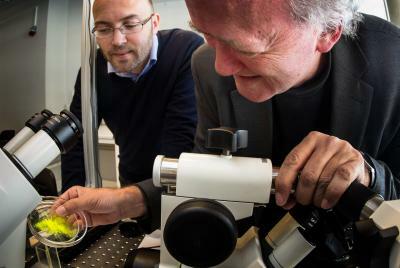 If anything, we expected that these sensitive calcifying algae would have decreased in the face of increasing ocean acidification (associated with increasing carbon dioxide entering the ocean from the burning of fossil-fuels). Instead, we see how these carbon-limited organisms appear to be using the extra carbon from CO2 to increase their relative abundance by an order of magnitude. “This provides one example on how marine communities across an entire ocean basin are responding to increasing carbon dioxide levels. Such real-life examples of the impact of increasing CO2 on marine food webs are important to point out as the world comes together in Paris next week at the United Nations Conference on Climate Change,” Balch added. “Something strange is happening here, and it’s happening much more quickly than we thought it should,” said Anand Gnanadesikan, associate professor in the Morton K. Blaustein Department of Earth and Planetary Sciences at Johns Hopkins and one of the study’s five authors. Gnanadesikan said the Science report certainly is good news for creatures that eat coccolithophores, but it’s not clear what those are. “What is worrisome,” he said, “is that our result points out how little we know about how complex ecosystems function.” The result highlights the possibility of rapid ecosystem change, suggesting that prevalent models of how these systems respond to climate change may be too conservative, he said. Coccolithophores are often referred to as “canaries in the coal mine.” Some of the key coccolithophore species can outcompete other classes of phytoplankton in warmer, more stratified and nutrient-poor waters (such as one might see in a warming ocean). Until this data proved otherwise, scientists thought that they would have more difficulties forming their calcite plates in a more acidic ocean. These results show that coccolithophores are able to use the higher concentration of carbon derived from CO2, combined with warmer temperatures, to increase their growth rate. When the percentage of coccolithophores in the community goes up, the relative abundance of other groups will go down. The authors found that at local scales, the relative abundance of another important algal class, diatoms, had decreased over the 45 years of sampling. The team’s analysis was of data taken from the North Atlantic Ocean and North Sea since the mid-1960s compiled by the Continuous Plankton Recorder survey. The CPR survey was launched by British marine biologist Sir Alister Hardy in the early 1930s. Today it is carried on by the Sir Alister Hardy Foundation for Ocean Sciences and is conducted by commercial ships trailing mechanical plankton-gathering gear through the water as they sail their regular routes. Dr. Willie Wilson, formerly a senior research scientist at Bigelow Laboratory, is now director of SAHFOS. “In the geological record, coccolithophores have been typically more abundant during Earth’s warm interglacial and high CO2 periods. The results presented here are consistent with this and may portend, like the “canary in the coal mine,” where we are headed climatologically,” said Balch. April 9, 2019 - Norwegian plankton developer braced for growth FeedNavigator.comThe Norwegian authorities have decided to allow the commercial harvesting of the zooplankter, Calanus finmarchicus, setting a quota at 254,000 tons per year. April 9, 2019 - Adding iron to oceans could increase carbon storage CosmosMassive geoengineering projects could prompt useful plankton blooms. Nick Carne reports. April 22, 2019 - Earth Day: Species at risk PRIHere's a look at vulnerable species according to the Earth Day Network that play a key role in their ecosystems and face endangerment from human activity. Biogas Power Plants Market is Likely to Witness huge Growth - Major Key Players are Wartsila, Air Liquide, EnviTec Biogas AG,etc.